Students worldwide and of all ages have rated Habla Ya in Boquete, Bocas del Toro, and in Panama City, on independent - 3rd party sites, making Habla Ya the most and best reviewed network of Spanish Schools in Latin America... by far! 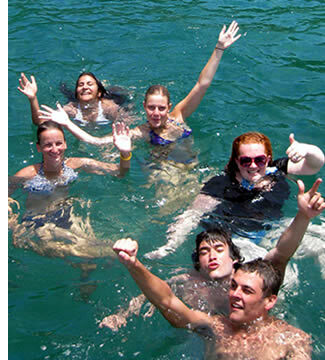 Join us: learn Spanish and have the vacation of your life in exciting Panama! Click here to write a review of Habla Ya Spanish Courses & Ecotourism on TripAdvisor. Click here to write a review of Habla Ya Spanish School, Bocas del Toro Campus on TripAdvisor. Click here to write a review of Habla Ya Spanish School, Panama City Campus on TripAdvisor. Reviews on MyLanguageTravel: Habla Ya Boquete, Habla Ya Bocas del Toro, Habla Ya Panama City. Reviews on 123TeachMe: Habla Ya Boquete, Habla Ya Bocas del Toro, Habla Ya Panama City. Reviews on Google: Habla Ya Boquete, Habla Ya Bocas del Toro, Habla Ya Panama City. You can leave your own review on those sites by clicking on the links above. Courtney Moran, July 2009 - Courtney's Journeys: BOQUETE! Rob & Rachel, October 2008 - Blog Centroamericano: Habla Ya! Click here to leave your review on Facebook about learning Spanish in Panama with Habla Ya. How to Choose a Spanish School in Latin America? Ask students who've already done it! Contact us!